I am by no means a 'stylish' person or anything near being fashionable... but I am starting to develop more of a personal style. 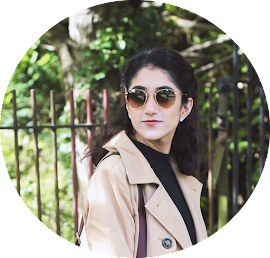 I would describe my style as quite classic, simple and minimal but also a bit quirky and bold! It would seem that those two descriptions completely contradict each other because it sort of does. Somedays I'm feeling jeans and a tee, other days I want to wear a dress and one day I wake up and I want to wear a huge oversized jumper! 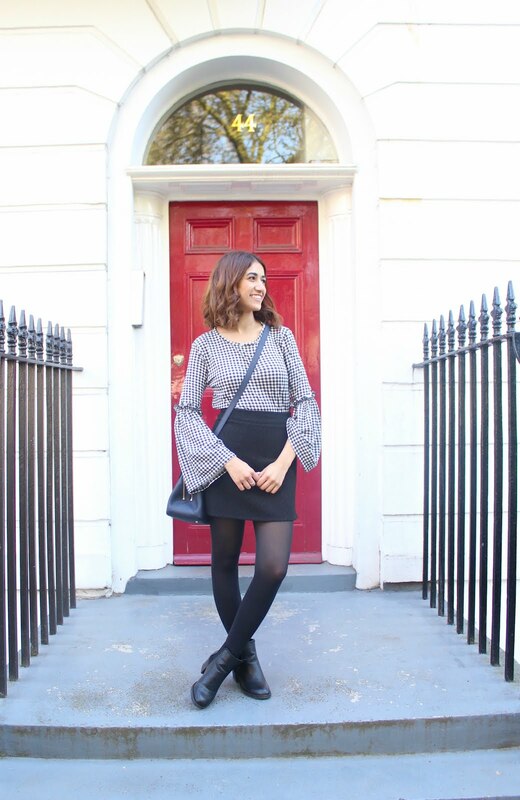 Anywayyyy, I went to London a few weeks back for the Blogosphere Cafe event (*ahem* blog post for that day here) and as it was a beautiful sunny day, I decided to sport one of my latest spring style purchases. So this little fashion piece in question is actually this gingham top! It has quite a bit going on... the gingham print is a statement in itself, flared sleeves and a little ruffle around the sleeves. It also has black strings behind the sleeves near your elbows that you can tie in different ways (I tied them into bows so you can't really seem them). I saw this top on Boohoo, current favourite website to shop from FYI, and I basically just fell in love and knew I had to have it. I know that this top will look good paired with so many things. A skirt, like I've worn here, jeans, culottes or even under a pair of dungarees! I can't wait to wear this out more and style it in different ways. Like I just mentioned, I decided to wear the top with a skirt. This one is my go-to black mini skirt also from Boohoo, surprise surprise. I wasn't too sure about footwear but I figured that heeled boots will just pull the look together. 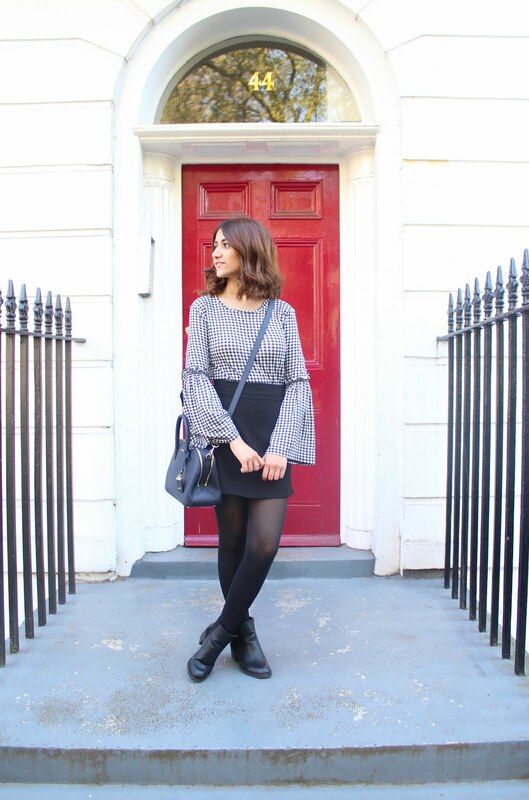 These black block heeled boots are from New Look and I have featured them in a few previous fashion posts on my blog! Of course I had to wear my navy DKNY bag and I thought that it actually looked really nice with this particular outfit and for this particular occasion. I thought I'd include an outtake, which is actually not too terrible looking at it now! Basically about 2.5 seconds after this photo was shot, I was laughing so much that I just fell over and down the stairs - talk about embarrassing. I now have a very badly bruised knee and yet another pair of ripped tights (LOL). It's just something that typical Fatima would do and I thought I'd share to give you a bit of behind the scenes info! Lovelovelove that top, Boohoo are on top form at the moment aren't they?! I've bought three playsuits from them this week which his more than I've bought from them in three years haha! You look gorgeous, Fatima! Gingham looks good on you! Such a cute outfit and I love the way you styled the top. You're right - it would definitely look great under dungarees! And that bag is soo dreamy omg. And I love that you included an outtake too, you're adorable! I love it, super cute! This is such a cute outfit, I am in love with that top!! What Is Your Makeup Worth?